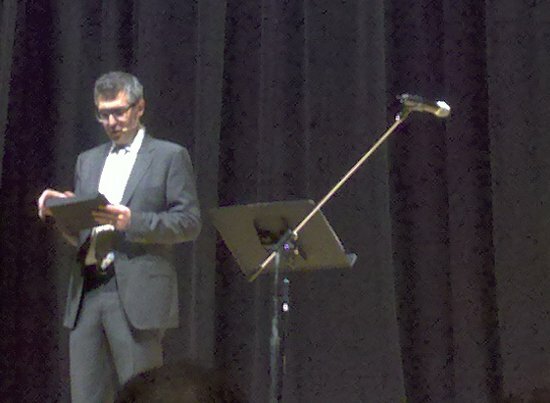 Ira Glass started the show with the lights off, simulating the experience of radio as he spoke to the audience. When the lights came up, he joked, “You don’t look like what I expected either.” Carrying a touchpad filled with audio samples, Ira deftly played music, narrated, and mixed interview clips into his talk, oftentimes improvised. He played a clip from the opening of a CNN special covering an aircraft carrier taking part in the war on terror. With deadly serious narration and a soundtrack Ira accurately described as “straight out of the opening credits of Battlestar Gallactica,” CNN was working overtime to make the story dramatic, working so hard as to be downright silly when you thought about it. News makes the world “scary, simple and small” Ira noted, and TAL wanted to take a different angle of life on the carrier, which he described as a “giant floating nuclear-powered dormitory.” So they started the story covering the kind of mundane work the majority of soldier on the carrier perform, specifically with a woman tasked with keeping the vending machines stocked and the day-to-day operations of that job. Ira Glass emphasized the importance of storytelling in keeping the audience’s attention. Something happens, and then something, and then something, and then a universal principle is revealed. I recently heard the same advice from Jane Goodall that the best way to get people to see your side of things was to tell stories. With this technique of storytelling TAL has made me see from the perspective of and sympathize with idealistic Tea Party members, stressed-out gang members, alleged terrorists, and wide wide world of diverse backgrounds and cultures. One show convinced me of the ideological diversity in the Republican Party by taking a varied perspective on the party at that time. 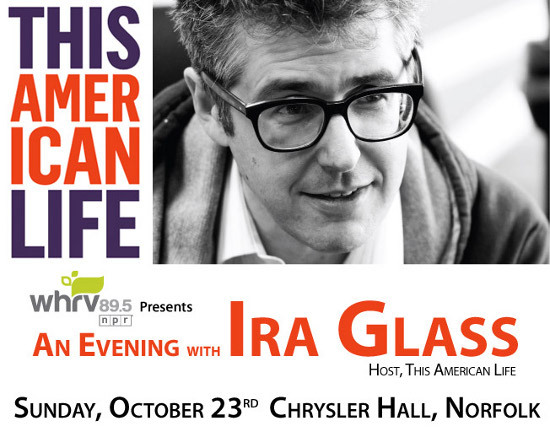 At one point in the talk, Ira Glass described Iraq as Ireland with the Shias being the Catholics and the Sunnis the Protestants, a perfect analogy that explained the cultural conflict there better than any mainstream news story I’ve ever heard on the situation. With the way the news makes the world so simplistic, caricatured, and tiny, is it any wonder the public getting its information from these sources seems to grow increasingly cynical about the state of things? News sources like NPR and the Economist try to convey the complexity, but their droll, elitist tone really turns people off to them. 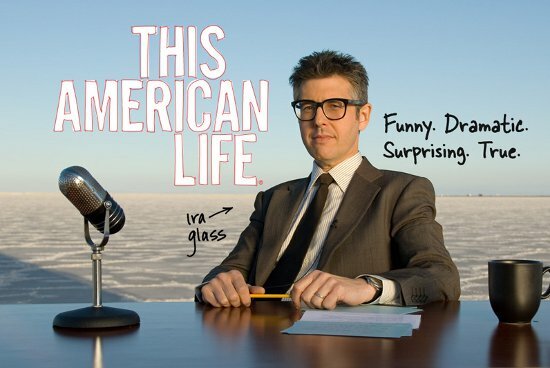 Ira Glass has spent years trying to convince someone in the media to do a news show in the format of TAL, and the show itself has even tried an episode focused on the events of the previous week. The episode This Week, covering current events, also happened to be the week Osama Bin Laden was assassinated. So they sent a reporter to Cairo to interview people’s reactions there, but the lives of Egyptians were much too busied with the task of rebuilding their country after the recent revolutions. So the story from Cairo was about the Muslim fundamentalists and the liberals getting together to try and find some way to coexist in a functional Democracy. It’s easy to see how such a weekly portrayal of current events could not just be popular, but could calm people down by giving them a peek into the complex worlds everyone else out there is dealing with as well. During the question and answer session an audience member asked Ira if there were any other programs that had adopted TAL’s storytelling style, and, to my great pleasure, he mentioned one of my favorite recent discoveries RadioLab, a show about science that uses storytelling to make the factually-fascinating subject matter engaging on a personal level (Ira has a very nice essay about the show). Ira invoked Arabian Nights in expressing the importance of storytelling. He described Scheherazade as “very Buffy the Vampire Slayer Season 3” and how she used storytelling to keep the king from killing her for years, after which he could not kill her because the many stories had made him sensitive to the perspective of others, especially Sheherazade’s father, who had spent night after night wondering if this would be the morning he would find his daughter dead.